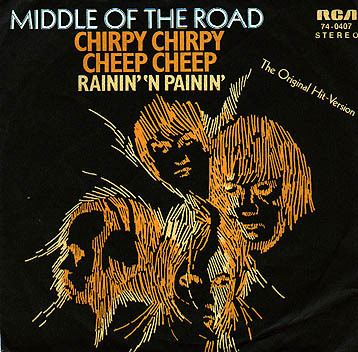 Song of the day: Middle Of The Road – "Chirpy Chirpy Cheep Cheep"
I’ve always adored this song, but I’ll be the first to admit that it’s puerile. Nevertheless, I love, love, love it. I’m prepared to lose any credibility I have in order to keep listening to it, and I’ll defend this song until I’m blue, or purple, or puce, or mauve in the face. Maybe because it’s the purest form of bubblegum pop, and I have an enormous soft spot for bubblegum pop. With bubblegum, it’s all about the tunes, which is probably why I love bubblegum. If you’re wondering why a UK hit by a Scottish band is featured on an Australian blog, it’s because it was a huge hit in Australia, too – and that’s reason enough for me. You are currently browsing the archives for the Briard category.